Blytheville Primary School students contributing their donation of aluminum can tabs for the Ronald McDonald House. 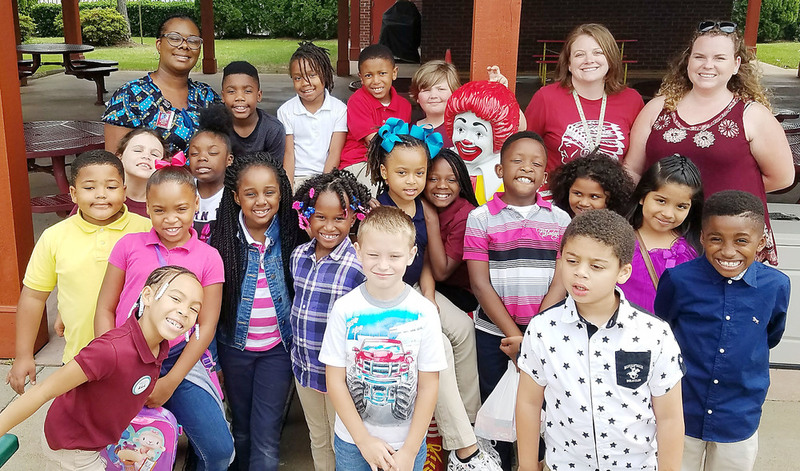 Since the beginning of the school year Blytheville Primary School students have been in a competition to see which class could donate the most aluminum can tabs. These tabs were donated to the Ronald McDonald House of Memphis, which houses families who are receiving treatment at St. Jude Children's Research Hospital. The money they receive from selling the tabs goes towards funding the house. The students brought in a total of 168 pounds of tabs. The Student Ambassadors from the first and second grades went on a field trip May 10 to officially donate them. The representative from the house gave a presentation to inform the children exactly how their tabs will benefit the families. The representative said they usually don't see donations this large all at one time. She also commented on how well-behaved and respectful the students were.